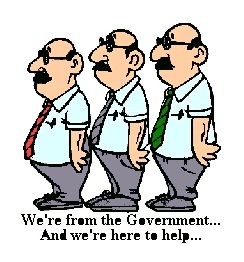 Bureaucrats are the ones really behind the scenes that control the economic events. The idea that we actually have a democracy is truly just propaganda. A democracy is where you vote on each issue. Many states have such things in place at least partially as various propositions are submitted to the people in California. We live in a Republic where people lie to get elected and then do the opposite. This is a systemic problem with no checks and balances. Watch what happens in Germany now – the federalization of Europe. Unfortunately, too many bureaucrats are the people who were stuffed in lockers back in high school and feel they have been cheated in life or treated unfairly. For this type of person, it is get even time. There are bureaucrats who just want the security of a government job and could really care less about the outside world. But for those who enjoy the power to get even, it is their total lack of comprehension of how the economy functions that causes laws to be created that are just insane. The Foreign Account Tax Compliance Act is ensuring that we are entering into a massive DEFLATIONARY mode with RISING VOLATILITY because LIQUIDITY has collapsed causing capital to hoard. Consequently, when everything turns down after 2015.75, we will see it far worse than the last time. Liquidity is still at about 50% of 2007 levels. People are not coming back for investment. I tried to wire $15,000 for expenses to Asia for my trip to pat for apartments in advance. HSBC refused to accept the wire from an American. I ended up having to pay by credit card. The old days of just sending money to someone are gone. Elliot Spitzer got caught up with the prostitute because the bank reported his payment to her to government as strange. Those who think what the NSA does is fine because they have nothing to hide, it is now illegal to actually send $20 in a birthday card to even a family member. The Post Office has the LEGAL right confiscate any cash sent through the mail. A friend got divorced and he tried to transfer money from a joint account to his ex-wife’s new account and had to prove where the money came from and why he was giving it to her. The idea that someone could blackmail you by kidnapping a family member, it is now physically IMPOSSIBLE to deliver cash without the police being involved. This just ain’t Kansas any more Dorothy. We have lost the freedom to even transfer money. The sheer number of expatriates renouncing their US citizenship has exploded during the second quarter of 2013, Some 1,131 filings were made compared to 189 in 2012. A friend in Switzerland who is married to an American for 20 years, has experienced the total insanity full force. His wife’s family died, and she could not move her inheritance to Switzerland to be managed by a bank because she is still an American. Then their 14 year-old son wanted to open his first bank account. Despite being born in Switzerland, he is still American because of his mother. The bank would not allow him to open an account because he is also an American. This is the problem that the bureaucrats have created and the unfortunately, there is no hope of even showing them what they have done to the global economy. It has to crash and burn before there will be reform. You cannot show what is happening and they will never admit they have done anything wrong. This is why the future looks so bleak.